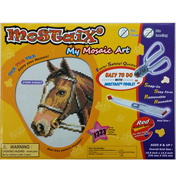 Mostaix are a great way to create a stunning mosaic picture for both children and adults alike! 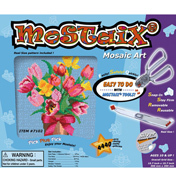 Within the Mostaix range there are three different series that advance in difficulty; Purple Ribbon, Red Ribbon and Silver Ribbon. 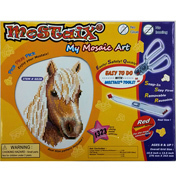 Simply follow the actual size image included within the kits or use the tiles to create unique pictures of your own design. 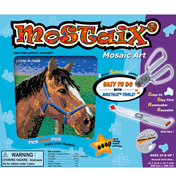 The Red and Silver Series include patented tools to make completing your Mostaix even easier; the tweezers allow for uncomplicated placement and removal of the tiles, whilst the safety tile divider cuts the tiles easily. In the Purple Series, the tiles are larger and round and can be placed and removed by hand. 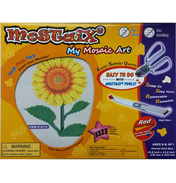 These products promote creativity, hand-eye coordination, encourage the observation and repetition of patterns and help with colour naming in the early years stages.